The Super Fly 4 gets high ratings from its current users. A lot of purchasers report that they have given these Jordan basketball shoes to their loved ones as gifts, and the recipients just love them. Some players say that this shoe model is light and comfortable. It’s like they are wearing the tenth Hyperdunk from Nike. A good number of purchasers say that the fourth Super.Fly from Jordan is a supportive shoe. A considerable number of players report that the Jordan Super.Fly 4 has good traction. Many wearers love this shoe’s aesthetics. They add that they usually get a lot of compliments when they wear these Jordan kicks. A handful of shoe owners leave comments about how easy it is to clean these Super Fly sneakers. Almost all expert reviewers agree that this shoe is among the best mid-top shoes released by the Jordan brand. Several wearers love that this pair of mid-top kicks from Jordan is breathable. 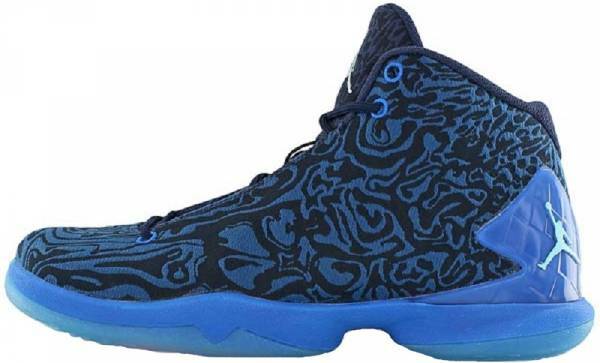 Some purchasers think that these Jordan basketball shoes are reasonably priced. Wearers’ assessments of this shoe’s fit is pretty varied; some say it’s perfect, a number says it runs arrow, and there are those who say it is just too big. A small number of wearers say that this shoe takes time to break in. Many of the Jordan Super.Fly 4’s current owners agree that the model gets the job done. It has great traction, it affords the wearer a fairly supportive and comfortable ride, and it has its uber cool aesthetics as a huge plus. The design is as bold as the Jordan Why Not Zer0.2’s. These reviewers further say that anyone who takes balling very seriously will surely appreciate this. It's not a game changer. The Michael Air Jordan Super.Fly 4 is a slam dunk on the court. I really have nothing bad to say about this shoe. It’s fun to play in, feels great underfoot and does everything well especially traction. The combination of great fit, materials, low-riding court feel, and responsive cushioning make this an almost great shoe. In order to deliver on the most important performance domains, the Jordan Super.Fly 4 comes with technologies that easily justify its $150 price. It has Zoom Air at the forefoot that ensures a reasonable amount of court feel. Its upper is made of mesh that ensures breathability. It has foam pads and fuse overlays in areas that need them. To give it traction, the solid rubber outsole is covered mostly with herringbone. This basketball shoe is heavily associated with Blake Griffin, who was still with the Los Angeles Clippers when the shoe was first released in 2015. The link to Griffin is so strong that many people consider it Griffin’s unofficial signature shoe. Cushion. The Jordan Super.Fly 4’s mesh upper sits on top of a full-length foam. The foam has a Zoom Air unit embedded at the forefoot. It aims to provide the right amount of responsiveness without sacrificing court feel. To further maximize the potential of the embedded Zoom unit, a FlightSpeed system is in place. This system is composed of a full-length carbon fiber that sits on top of the Zoom to enhance its compression and evenly distribute the returned energy along the length of the shoe. Traction. The solid rubber outsole of the Jordan SF4 is largely covered by a herringbone pattern. The lateral side features wavy lines that aim to support hard cuts and abrupt changes in direction that are common in basketball. Length and Width. Reviews about how the Jordan Super.Fly 4 fits are quite varied. There are wearers who say that it is just perfect. There are those who are disappointed because it runs a bit narrower than expected. And there are those who say that this model is a bit larger than usual. Because of this, new buyers are advised to find ways to fit the shoe before purchasing. Lockdown. To keep the foot locked in place, the shoe has a webbed lacing system. The carbon fiber plate in the midsole also acts as an effective protection against torsional twists that may cause not only instability but also serious injuries. The mesh upper of the Jordan Super Fly 4 is backed with foam in areas that need cushioning such as the collar. There is fuse on high-wear spots to ensure durability. The Jordan Super.Fly 4 also has versions that use Jacquard mesh on the upper, giving this Jordan basketball shoe more of a lifestyle appeal. More than just changing the color, Jordan replaces the upper material of the usual Super.Fly 4 with a special type of mesh to come up with the Super.Fly 4 Jacquard. It will be impossible not to recognize this shoe because it is covered with swirls of two contrasting colors. The Marvin the Martian colorway of the fourth Super.Fly proves that the decades old partnership between Looney Tunes and the Jordan brand is still very much alive. This version of the shoe features the characteristic green, red, and black colors of the famous Looney Tunes character. This shoe became so popular with fans, especially the little ones, largely because of a commercial that Jordan produced to promote it. In the video, Blake Griffin and Marvin the Martian are in a dunking contest. Blake Griffin tops an already over-the-top performance by Marvin when he dunked in his Super.Fly 4 Marvin the Martian (ironically). Like some of the signature basketball shoes of Kevin Durant and the King LeBron James, the unofficial signature shoes of Blake Griffin also cross over to other sports. The Seahawks colorway of the Super.Fly 4 straightforwardly references the Seattle Seahawks, the team of Jordan brand signee Earl Thomas. The shoe features the characteristic college navy and action green colors of the American football team.